The Autry National Center's newest exhibit, Jews in the Los Angeles Mosaic, which just opened and runs through early January 2014, provides a broad overview of the multidimensional history of Jews in Los Angeles from the 1850s to the modern day. Elements relating to families, religion, business and economics, Hollywood and the entertainment industry, sports, politics and other topics are included. One interesting tidbit was a section of the little-known Iranian Jewish community. Naturally, a significant part of the exhibit, as representing Jewish life in the city and region, touches on the importance of Boyle Heights as the center of Los Angeles Jewry for several decades, especially between 1920 and 1950. Yesterday, a symposium was held at the museum as part of the exhibit opening and it was telling that, when someone asked the audience how many of them had a connection to Boyle Heights, dozens of attendees raised their hands. Highlights in the exhibition relating to Boyle Heights included emphasis on such major institutions as the Breed Street Shul (for more on the Shul click here) and the Phillips Music Company store (see this great site on the Phillips store here). The first part of the event featured tours of the exhibit and three persons were stationed to discuss aspects of the display. In addition to interesting talks by a descendant of the early Newmark and Lazard families and on the story of Sephardic Jews, whose roots dealt mainly with Spain before the 1492 expulsion of them by the crown, there was a fascinating presentation touching upon Boyle Heights. This talk was by Carol Schneider, whose mother, Lorraine, was born in Chicago, but came to Boyle Heights as a child. Later, Lorraine Schneider became famous for an iconic piece of art that has become a focal point for anti-war activists. Lorraine Schneider's story will be the subject of the next post on this blog, but, meantime, anyone interested in Boyle Heights and, of course, the history of Jews in Los Angeles, should make a concerted effort to see this exhibit and its broad overview of a complex, fascinating and varied history. 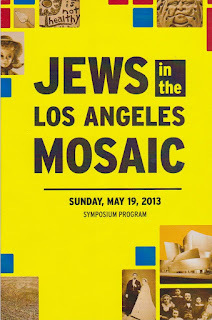 For more on Jews in the Los Angeles Mosaic, visit the museum's Web site page for the exhibit here.